Free Shipping on orders over 40,09€. Note: This charger can charger the Xiaomi 5 at QC3.0 mode. more efficient than Quick Charge 2.0.WithQuick Charge 3.0 you can charge a typical phone from 0 to 80% in about 35 minutes. charging for non-Quick Charge devices. non-QC devices and will charge at their normal charging speed (up to 5V/2A Max). Standard Fast 4.4A Mode: 5V/4.4A. Rated at 22W. 1.5m AC power cord with US UK EU AU plug. Most of the customers will be able to find a suitable plug. Lightweight, compact and easily portable. Contains internal Power3S protection for over-current, overheat, short circuit and over-voltage detection. 2. 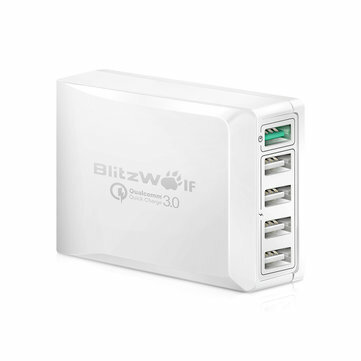 What if the 5-ports Desktop Charger is not charging my device(s)? 4. My device charges at 1Amp,will this charger's 2.4Amp output harm it? 5. Will my device charge at full speed 2.4A? 2.4A charging is dependent on the capability of your device, please check your smartphone's manual to see the maximum Amps (A) your device can charge at. 6.What should I do if one port isn't working properly? the cables ( including the power cable ) for five seconds and try again . The charger can work perfectly again. 7. What is different between the 2.4A port & QC3.0 port? port or another normal chargers. 8.If my devices is not compatible with QC3.0, can I use the QC3.0 port to charge?